Royal Air Maroc (RAM) is the national airline of Morocco and is majority government owned. The carrier is based at Mohammed V International Airport, Casablanca, and operates an extensive domestic and regional network within Morocco and Africa together with services to Europe, the Middle East and North America. By Capa Aviation. We spent most of 2009 in Morocco, working from an office in our family villa near Essaouira and making frequent business trips to our colleagues in Casablanca, Rabat, Agadir, Marrakech and other places of interest - driving along most of Morocco's scenic Atlantic Coast. We also experienced the excellent train service and appreciated its seamless airport access. During those months, we flew Royal Air Maroc to Cairo, Egypt for the ATA 34th Annual Congress - and to France on other matters. We have always enjoyed our travels with this great airline and are pleased that it is again the Official Airline of the ATA Congress. y career as a Travel industry professional and travel agent, I had the pleasure of working for Royal Air Maroc in Casablanca -my birthplace - and flew on many of their routes around the world. My sister Izza was a flight attendant on the same airline a few years after I moved to Cote d'Ivoire. That's why it was great news for me when ATA held major events in Marrakech and Fes, Morocco, with Royal air Maroc as the official airline. Africa (North Africa, West Africa and South Africa). Domestic Routes Our daily flights express flights connect Casablanca to the main Moroccan cities. Express flights: For more flexibility, several flights are scheduled on the same day at different times for the same city-pair: 4 to 5 daily flights from Casablanca to Marrakech and from Casablanca to Agadir, with many opportunities of a same day return. ARIM: Passengers traveling without luggage, can make a single check-in for their same day return journey. INTER + CARD : The holder of such card gets, over 12 months, a 40% discount on the entire domestic network. The individual subscription fee is 2000 MAD. For corporate subscriptions the fee is 2000 MAD for two, 3500 for three and 4000 for four members. For each additional member an extra charge of 1000 MAD is applicable. Spouse and Family Fares: When the couple travel together a 50% discount of the full fare applies to one of them. When a family travel together (at least 3 persons) with at least one of the parents, the child fare (from 2 to 12 years) goes down from 50 to 75%. Infants not included in the offer. Youth and Student Fares: Depending on the routes, a 50 to 75% discount applies to youngster from 12 to under 22 years of age, and to students under 31 years. Royal Air Maroc's fleet, 30 aircraft strong put the airline in the forefront of aviation service, designed only to make the world more accessible to you. 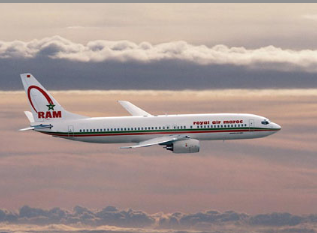 For the extension and modernization of its medium and long haul fleet over a period of 10 years (2002-2012) and further to a call for tenders to which Boeing and Airbus Aircraft manufacturers replied, Royal Air Maroc has decided to purchase 20 medium haul B.737 next generation aircraft, 2 long haul B.767 aircraft and 4 Airbus A.321-200 aircraft. SEATTLE, Jan. 30, 2002 - As part of its fleet expansion plans, Royal Air Maroc (RAM), the flag carrier of the Kingdom of Morocco, today took delivery of its first Boeing 767-300ER (extended-range) twin-aisle airplane. The second 767-300ER in the order is scheduled to be delivered next month. The airplanes are being leased from GE Capital Aviation Services (GECAS) of Stamford, Conn.
"The 767 fleet crosses the Atlantic 2,500 times per week - more than any other airplane - and I'm pleased that now it will be making regular trips for Morocco," said Seddik Belyamani, executive vice president of Sales, Boeing Commercial Airplanes. "I am confident that Royal Air Maroc has made the perfect choice for a very competitive market." RAM selected the 767 after in-depth analysis of the competing product. In the end, RAM decided on the Boeing 767-300ER based on technical, operational and economic considerations. "We were impressed by the 767's operating costs, range and improved cabin," said Mohamed Berrada, RAM chairman and CEO. "The 777-style cabin will provide optimal comfort for our passengers while providing greater flexibility to fly more trans-Atlantic routes, greatly improving its North American service." Boeing and RAM have had a business relationship since 1970, when RAM took delivery of a 727-200. The carrier currently operates a fleet of 31 Boeing airplanes, including the 737-200, -400, -500, -700 and -800;747-200, 747-400; and 757-200. RAM will be leasing the airplanes from GECAS, a global aviation solutions provider offering financing for short- and long-term equipment needs, acquisition financing, aircraft remarketing and sale/lease-back arrangements. The GECAS Web site is at http://www.gecas.com/. The 767 offers the lowest operating cost per trip of any wide body airplane and is one of the most popular twin-aisle airplanes ever built. There are more than 800 767 airplanes in service with 80 operators around the world. The 767 has accumulated more than nine million flights and has carried millions of passengers.